Take a little more transit and eat a little less meat — two things you can do to reduce your impact on the environment. In this installment of Meatless Mondays with Metro, let’s check out Sweet Veggie. Sweet Veggie is a very cost friendly all-you-can-eat vegetarian restaurant specializing in Taiwanese-style food. I particularly like their Lion’s Head meatballs — it’s pretty hard to find vegetarian versions of it in general, much less versions that taste good. And they have make-your-own boba milk tea and shaved ice stations, which is kind of fun. It’s also a good place to visit if you like temple food, because they don’t use garlic or onion in any of their dishes. 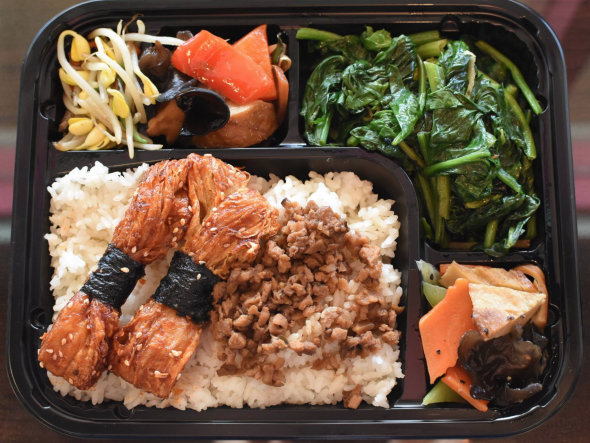 Many Buddhist temples serve vegetarian lunches to the public, but it’s not always convenient to drop by when the temples are open. So you can go to Sweet Veggie and fill up a plate to satisfy that strangely specific craving. Sweet Veggie is located near Mt. SAC. To get there, take Foothill Transit bus 486 to Amar/Sunset, or take Foothill Transit 194 — this line connects to the Metro Silver Line and some other buses at El Monte Station — and 289 to Grand/Amar. They recently opened up a new location near the SR-60/SR-57 interchange, which you can reach via Foothill Transit Bus 482 or 493 to Golden Springs/Lemon. Thanks for giving the eastern part of the county some love. Sage is a good Vegan restaurant!!!! There is one in Echo Park, Pasadena and Culver City.